As time is passing Blogger is getting better and better. With more number of users, the developers have increased too. Unlike WordPress more than 98% of blogger templates available are free of cost. But now we are seeing a slow but effective growth in the blogger paid templates. Documentation for beginners and etc. 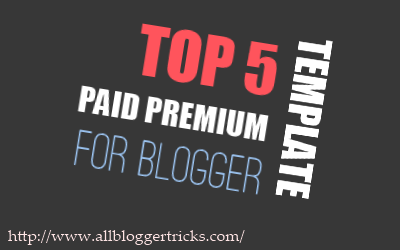 Below I present Top 5 Paid Premium Templates for Blogger which you can buy and use in your blog. Grid Spot designed by Tien of BloggerItems.com can be said to be the first template after which paid templates came one after the other. Grid Spot comes with features like Auto Logo, Responsive Design etc. Bpress is another example of Modern Blogger Template with features like Popup Contact form, Easy customization, ticker etc. Developed by Lasindu Nadisan Bpress is an awesome magazine style blogger template. Sevida designed by MKR is another great blogger template. It has a responsive layout, magazine style premium look, Ajax search, Custom commenting system and many other features. This template looks and its layout is dynamic. Cody is a nicely furnished blogger template. It looks are no less than of a WordPress template. Other than that is SEO Optimized and has a flexible layout. Cody is fully responsive and its rich look makes it more attractive. Flat News which is again designed by Tien is literally one of the best blogger template we have ever seen. It looks are killing and on the other side it is equally convenient to edit this template. The template has many features such as Responsive design and easy customization. If you are ready to spend some bucks on your blog, this template will be worth your money. We come to the end of this list. Lastly I want to conclude that Premium templates may need you to pay but they have no alternates which can completely counterfeit them. Try these templates today and make your blog best from the rest. Can u please provide sevida to me for free . Nothing is free here :P You need to buy the template in order to use it. May I know the same wordpress template that look like sevida? Hello,i like this offer.but even though one has need some custmization ,than what to do? why not you share some tips for changing tabs looks,some css effect?if you wrote some thing on all this,than it may helpful to all. what tips you need ? Amazing Collections.., Even I already have the Sevida Template. Wow, thank you for quoting down top five of them. It will be good for me in deciding which one to pay for.